This is what the Chartered Institute of Housing press release (below) made of my speech from Thursday. I try to take after the Andy Warhol approach to these things – measure the size of the article rather than get too hung up on the words. Though I thought it was ok. Walking back to the station afterwards, I was thinking how we ought to talk more with the brands in the streets, where advantaged thinking is used to sell less significant things far more effectively than we manage to promote the importance of investing in young people. This came back to haunt me at the weekend, passing through a shopping mall in East London. A poster caught the corner of my eye because I could see it had a famous youth charity's logo in it. Something about young people, at risk, the future, etc. The images didn’t make me stop walking. I felt disappointed, let down. If it was selling fruit and veg, I wouldn’t have made a note to shop there. Where is the Saatchi and Saatchi for young people? They famously said 'Labour isn’t working' back in 79. Well, now it’s Charity that isn't working. Maybe we should employ some of the 1 in 5 we are meant to be representing so we can get the message right…. 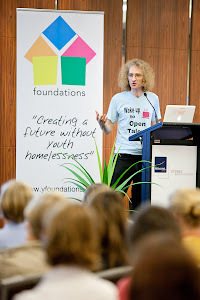 Colin Falconer, director of innovation at the Foyer Federation, today told housing professionals they need to change the way they portray young people in society. Speaking at our South East Conference, Colin told delegates housing providers have a crucial role to play in developing the advantages young people need to make a successful transition into adulthood. He said: “Resources in the sector are sometimes too focused on supporting needs, deficits and problems, rather than investing in young people's goals, assets and potential. He cited the case of young people who did not get involved in last August’s riots because they felt they had a stake in the community in which they lived. Adding: “It is particularly important we invest in young people and their talents now because high youth unemployment and wider economic challenges mean that we cannot afford to maintain the status quo. “Our approach has to change from the 'disadvantaged thinking' of the past to adopt the 'advantaged thinking' that enables other sectors and individuals to thrive.